- Privacy Sweep supported clean for Microsoft Edge (Spartan). - Updated IObit Uninstaller 4.3 for more stable and thorough clean. - Default Programs Tool added support for Nitro Reader 3, Nitro Pro 9, Pegasus Mail, The Bat and Becky. - Enhanced the privacy sweep for Chrome 43.0, Firefox 38.0, Oprea29.0, Skype 7.5, AIMP 3.6, etc. 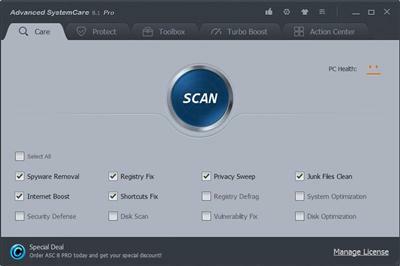 - Updated and expanded database for Malware Removal, Registry Fix, Software Updater, Startup Manager, Surfing Protection, Privacy Sweep and Junk Files Clean. - Fixed bugs in previous version.